Jim Aparo and Bill Sienkiewicz Batman #416 Cover Original Art (DC, 1988). Nightwing (the former Robin) confronts Batman about his decision to take on a new sidekick in "White Gold And Truth." One of the most celebrated artists ever to draw Batman, Jim Aparo had a smooth, bold style that brought power and grace to the Caped Crusader, or in this case, Nightwing and Robin. Offered here is a spectacular cover by Aparo, and his work has a place of honor in the hearts of most Bronze and Modern Age comic collectors. This is a superb example of his dynamic cover design that would grace any comic art collection. 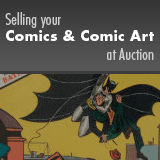 This "Bats-terpiece" has an image area of 9.75" x 15" and it's in Excellent condition. From the Shamus Modern Masterworks Collection.